1.3 What is the purpose of teams? Teams are an important aspect of Toon Blast, but a lot of people are unclear about what exactly teams entail in Toon Blast. In this post everything you’ve ever wondered about Toon Blast Teams will be answered. We’ll go over exactly what teams are, how to join them, Team Tournaments and much more. So without any further delay let’s get into it. When you reach level 20 in Toon Blast you’re able to either join a team or create your own team. 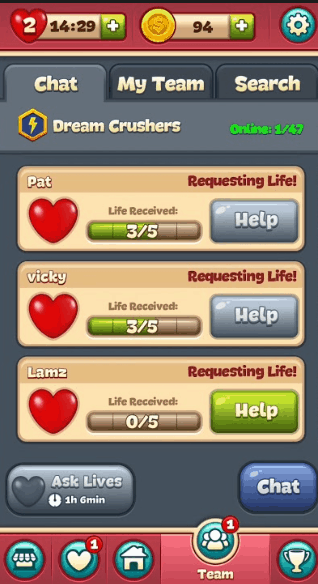 Joining a team is free but creating a team costs coins. Most players therefore opt to join someone else’s team instead of creating their own team. 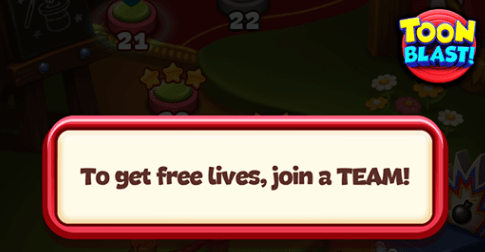 However, if you already have a lot of coins, for example because you used the guide we released in our post on Toon Blast Hacks then of course creating your own team is a great option. Teams are basically a group of players that work together. You can also chat with the players in your team. Joining a team is very easy. Simply tap on the “Team” tab and you’ll have an overview of teams that you can join. You can also use the search function if you have a specific team in mind (for example one with friends) that you want to join. Sometimes teams appear as “closed”, you can still apply to them but the leader must approve you before you can join. What is the purpose of teams? Teams are very useful in Toon Blast. Being in a team with other players allows those players to help you out and vice versa. You can give them lives for free, or they can give them to you. In addition, you can join Team Tournaments. Team tournaments, as the name suggests are tournaments that you can play with your team. Before your team can play team tournaments it needs to have at least 10 players. The team tournament will have 10 teams in it that are about evenly matched in skill level. You can obtain points in the team tournament by obtaining stars from levels. The team score is calculated by taking all the stars that the players on the team have earned during the tournament. The top 5 teams in the team tournament will receive prizes while the bottom 5 teams will receive nothing so it’s important to do as well as you can in the tournaments because there’s a lot on the line. That’s about all there is to know about teams in Toon Blast. If you have any question feel free to leave a comment. Oh, and if you’re looking for more tips check out our post on Toon Blast Tips & Tricks. If you’re wondering what the highest level in Toon Blast is, we’ve got that covered here.